LA COSTA GLEN RETIREMENT community’s STAR program rewards employees who provide exceptional service. 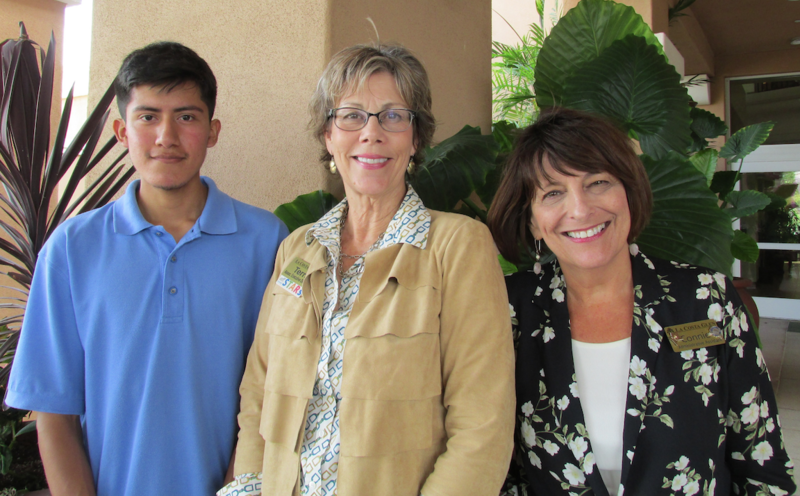 From left: Daniel Medina, laundry worker, STAR employee for the first quarter 2018; La Costa Glen Interim Executive Director Terri DeBoever; and Connie Herbert, administrative assistant, STAR employee for the second quarter 2018. CARLSBAD – Looking for a rewarding job with outstanding potential for career growth and advancement? The La Costa Glen continuing care retirement community in Carlsbad is literally a great place to work, according to the independent research and consulting firm Great Place to Work®. A global authority on high-performance workplace cultures, Great Place to Work produces the annual “100 Best Companies to Work For” list for Fortune magazine, as well as lists identifying the best workplaces for millennials, women and diversity. La Costa Glen earned the “Great Place to Work” certification based on an extensive survey of employees from all departments, job functions and levels of experience. The survey was conducted earlier this year and measured more than 60 categories to evaluate employee satisfaction including respect, fairness, employee pride in the community, camaraderie and belief that their work makes a difference. La Costa Glen had to meet the threshold in each category in order to be certified. According to Terri DeBoever, interim executive director, the Great Place to Work certification validates La Costa Glen’s STAR employee program. STAR, which stands for Service to Residents and Colleagues, Team Success, Aim for Excellence and Do the Right Thing, was established a few years ago to reward employees who provide exceptional service to La Costa Glen residents and their fellow co-workers. According to DeBoever, La Costa Glen employees are nominated for the STAR award by residents and their peers. A committee then votes to determine the STAR of each quarter and ultimately decides upon the “STAR of the Year.” The quarterly employees and the STAR of the Year each receive awards funded by La Costa Glen management. The STARs can select from awards ranging from hotel accommodations and airline tickets to concerts and gift cards. The winner of the STAR award for the first quarter of 2018 was Daniel Medina, laundry worker, and the second quarter STAR was Connie Herbert, administrative assistant. “These employees embody what it means to live the STAR values every day, and we are delighted to recognize their positive contributions to daily life at La Costa Glen,” DeBoever said. To learn more about career opportunities at La Costa Glen, please visit La Costa Glen at www.lacostaglen.com and click “Careers” or go to http://bit.ly/2OUDEyg.